The Maxxis Chronicle is ready for adventure. From after-work trail rides to bike-packing expeditions, the Chronicle can be called into duty. The tread design offers grip at any angle and the 3.00-inch casing provides a comfortable ride. 60 or 120 TPI casing options are available. EXO PROTECTION An extremely cut-resistant and abrasion-resistant material added to the sidewalls of select mountain tires. This densely woven fabric is also lightweight and highly flexible, ensuring that the performance of the tire remains unaffected. Choose EXO Protection for exceptionally rocky, treacherous trails where the chance of sidewall cuts and abrasions is high. 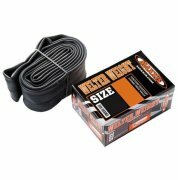 TUBELESS READY Tubeless tires provide the rider with many benefits: the ability to run lower air pressures, which improves traction; lower rolling resistance when compared to a tube-type tire; and less chance of flatting since there is no tube. 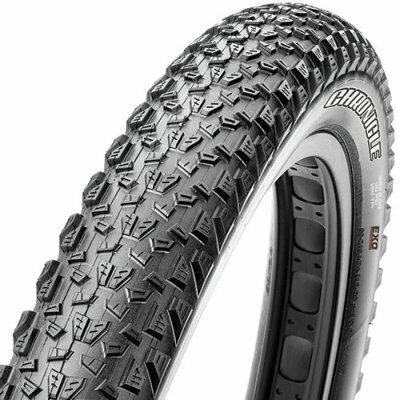 Maxxis Tubeless Ready (TR) tires provide the benefits of a UST tubeless tire without the weight penalty. Our TR tires use a standard casing and require the use of a liquid sealant in order to make them airtight. Maxxis Tubeless Ready tires are the only Maxxis tires approved for use with liquid sealants. Using a liquid sealant in any non-TR Maxxis tire will void the warranty.